Wind chill temperatures will drop to as cold as -30° in St. Louis and could be even colder in other parts of the 5 On Your Side viewing area. 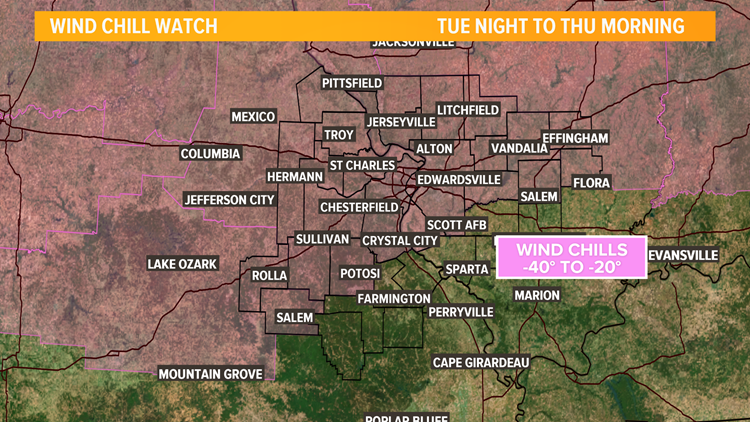 ST. LOUIS — A wind chill watch has been issued for the St. Louis area for Tuesday evening through Thursday morning. The dangerous cold wind chills could cause frostbite on exposed skin in as little as 10 minutes. The arctic air begins Monday, bringing, bringing light rain showers, gusty winds and a huge drop in temperatures later in the day. Monday morning starts relatively mild. A few showers will be around and temperatures will be in the 30s to around 40°. Rain showers will be light and will mainly fall before noon. Our strong cold front moves through just before midday, dropping temperatures sharply and increasing the wind. Winds will be strongest in the afternoon, with gusts closer to 35 mph. Temperatures will fall into the 20s by 3 p.m. Expect a few flurries and cloudy skies Monday afternoon and evening. Arctic winds will continue into the night and throughout Tuesday. Overnight lows will fall toward 10°, with high temperatures in the 20s Tuesday. Sunny skies early will give way to afternoon clouds and a few snow showers in the bi-state. Another cold front moves in Tuesday, bringing yet colder weather—single digits below zero—Tuesday night. That's when the wind chill watch goes into effect. Dangerously cold wind chill temperatures Wednesday morning. Wednesday could be one of the coldest day of 2019, with a high temperature in the single digits after our below 0° start. 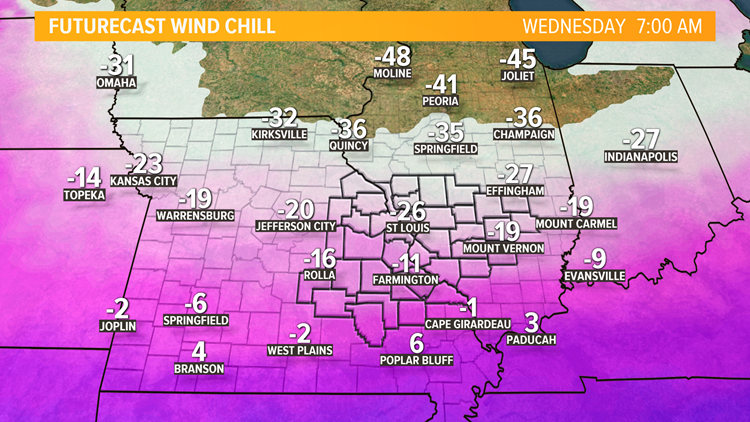 Wind chill temperatures will be brutal, as cold as -20°F for the metro St. Louis region. This will be dangerously cold weather, especially on Wednesday morning. More single-digit temperatures are forecast Thursday morning, with milder 20s during the day. Things are looking warmer by the end of the workweek, with forecast temperatures in the 40s to 50s for Friday and the weekend. There may be some rain showers late Sunday into Sunday night. Otherwise, the weekend will be partly sunny and mainly dry. We'll turn a little colder again next week. If you need help with the cold in the next few days, you can dial 211 to get information to the nearest warming centers. St. Louis Winter Outreach will also have volunteers patrolling the area to ensure people in need can find help. You can find more information about the organization on their Facebook page. If you would like to help, you can volunteer here.